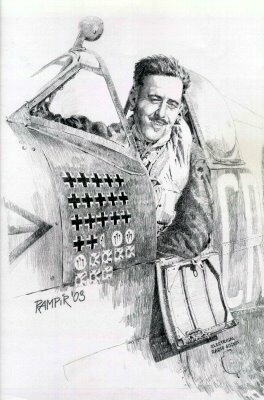 Portrait of a leading Australian Spitfire ace, W/Cdr Clive “Killer” Caldwell, DFC & Bar, DSO, drawn by Pavel Rampír. Pencil on cardboard. Caldwell was officially credited with shooting down 28.5 enemy aircraft, in over 300 operational sorties over North Africa and Australia.